A globular cluster is a spherical collection of stars that orbits a galactic core as a satellite. Globular clusters are very tightly bound by gravity, which gives them their spherical shapes and relatively high stellar densities toward their centers. The name of this category of star cluster is derived from the Latin globulus—a small sphere. 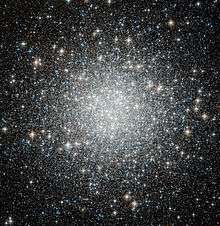 A globular cluster is sometimes known more simply as a globular. Globular clusters, which are found in the halo of a galaxy, contain considerably more stars and are much older than the less dense galactic, or open clusters, which are found in the disk. Globular clusters are fairly common; there are about 150 to 158 currently known globular clusters in the Milky Way, with perhaps 10 to 20 more still undiscovered. These globular clusters orbit the Galaxy at radii of 40 kiloparsecs (130,000 light-years) or more. Larger galaxies can have more: Andromeda Galaxy, for instance, may have as many as 500. Some giant elliptical galaxies (particularly those at the centers of galaxy clusters) such as M87, have as many as 13,000 globular clusters. Every galaxy of sufficient mass in the Local Group has an associated group of globular clusters, and almost every large galaxy surveyed has been found to possess a system of globular clusters. The Sagittarius Dwarf galaxy and the disputed Canis Major Dwarf galaxy appear to be in the process of donating their associated globular clusters (such as Palomar 12) to the Milky Way. This demonstrates how many of this galaxy's globular clusters might have been acquired in the past. Although it appears that globular clusters contain some of the first stars to be produced in the galaxy, their origins and their role in galactic evolution are still unclear. It does appear clear that globular clusters are significantly different from dwarf elliptical galaxies and were formed as part of the star formation of the parent galaxy rather than as a separate galaxy. The first known globular cluster, now called M22, was discovered in 1665 by Abraham Ihle, a German amateur astronomer. However, given the small aperture of early telescopes, individual stars within a globular cluster were not resolved until Charles Messier observed M4 in 1764. The first eight globular clusters discovered are shown in the table. Subsequently, Abbé Lacaille would list NGC 104, NGC 4833, M55, M69, and NGC 6397 in his 1751–52 catalogue. The M before a number refers to Charles Messier's catalogue, while NGC is from the New General Catalogue by John Dreyer. When William Herschel began his comprehensive survey of the sky using large telescopes in 1782 there were 34 known globular clusters. Herschel discovered another 36 himself and was the first to resolve virtually all of them into stars. He coined the term "globular cluster" in his Catalogue of a Second Thousand New Nebulae and Clusters of Stars published in 1789. The number of globular clusters discovered continued to increase, reaching 83 in 1915, 93 in 1930 and 97 by 1947. 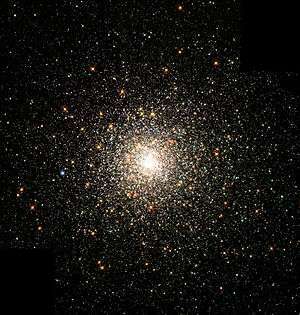 A total of 152 globular clusters have now been discovered in the Milky Way galaxy, out of an estimated total of 180 ± 20. These additional, undiscovered globular clusters are believed to be hidden behind the gas and dust of the Milky Way. Beginning in 1914, Harlow Shapley began a series of studies of globular clusters, published in about 40 scientific papers. He examined the RR Lyrae variables in the clusters (which he assumed were cepheid variables) and would use their period–luminosity relationship for distance estimates. Later, it was found that RR Lyrae variables are fainter than Cepheid variables, which caused Shapley to overestimate the distance to the clusters. Of the globular clusters within the Milky Way, the majority are found in a halo around the galactic core, and the large majority are located in the celestial sky centered on the core. In 1918, this strongly asymmetrical distribution was used by Harlow Shapley to make a determination of the overall dimensions of the galaxy. By assuming a roughly spherical distribution of globular clusters around the galaxy's center, he used the positions of the clusters to estimate the position of the Sun relative to the galactic center. While his distance estimate was in significant error (although within the same order of magnitude as the currently accepted value), it did demonstrate that the dimensions of the galaxy were much greater than had been previously thought. His error was due to interstellar dust in the Milky Way, which absorbs and diminishes the amount of light from distant objects, such as a globular clusters, that reaches the Earth, thus making them appear to be more distant than they are. Shapley's measurements also indicated that the Sun is relatively far from the center of the galaxy, also contrary to what had previously been inferred from the apparently nearly even distribution of ordinary stars. In reality, most ordinary stars lie within the galaxy's disk and those stars that lie in the direction of the galactic centre and beyond are thus obscured by gas and dust, whereas globular clusters lie outside the disk and can be seen at much further distances. Shapley was subsequently assisted in his studies of clusters by Henrietta Swope and Helen Battles Sawyer (later Hogg). In 1927–29, Harlow Shapley and Helen Sawyer began categorizing clusters according to the degree of concentration the system has toward the core. The most concentrated clusters were identified as Class I, with successively diminishing concentrations ranging to Class XII. This became known as the Shapley–Sawyer Concentration Class (it is sometimes given with numbers [Class 1–12] rather than Roman numerals.) In 2015, a new type of globular cluster was proposed on the basis of observational data, the dark globular clusters. The formation of globular clusters remains a poorly understood phenomenon and it remains uncertain whether the stars in a globular cluster form in a single generation or are spawned across multiple generations over a period of several hundred million years. In many globular clusters, most of the stars are at approximately the same stage in stellar evolution, suggesting that they formed at about the same time. However, the star formation history varies from cluster to cluster, with some clusters showing distinct populations of stars. An example of this is the globular clusters in the Large Magellanic Cloud (LMC) that exhibit a bimodal population. During their youth, these LMC clusters may have encountered giant molecular clouds that triggered a second round of star formation. This star-forming period is relatively brief, compared to the age of many globular clusters. It has also been proposed that the reason for this multiplicity in stellar populations could have a dynamical origin. In the Antennae galaxy, for example, the Hubble Space Telescope has observed clusters of clusters, regions in the galaxy that span hundreds of parsecs, where many of the clusters will eventually collide and merge. Many of them present a significant range in ages, hence possibly metallicities, and their merger could plausibly lead to clusters with a bimodal or even multiple distribution of populations. Observations of globular clusters show that these stellar formations arise primarily in regions of efficient star formation, and where the interstellar medium is at a higher density than in normal star-forming regions. Globular cluster formation is prevalent in starburst regions and in interacting galaxies. Research indicates a correlation between the mass of a central supermassive black holes (SMBH) and the extent of the globular cluster systems of elliptical and lenticular galaxies. The mass of the SMBH in such a galaxy is often close to the combined mass of the galaxy's globular clusters. No known globular clusters display active star formation, which is consistent with the view that globular clusters are typically the oldest objects in the Galaxy, and were among the first collections of stars to form. Very large regions of star formation known as super star clusters, such as Westerlund 1 in the Milky Way, may be the precursors of globular clusters. Globular clusters are generally composed of hundreds of thousands of low-metal, old stars. The type of stars found in a globular cluster are similar to those in the bulge of a spiral galaxy but confined to a volume of only a few million cubic parsecs. They are free of gas and dust and it is presumed that all of the gas and dust was long ago turned into stars. Globular clusters can contain a high density of stars; on average about 0.4 stars per cubic parsec, increasing to 100 or 1000 stars per cubic parsec in the core of the cluster. The typical distance between stars in a globular cluster is about 1 light year, but at its core, the separation is comparable to the size of the Solar System (100 to 1000 times closer than stars near the Solar System). However, they are not thought to be favorable locations for the survival of planetary systems. Planetary orbits are dynamically unstable within the cores of dense clusters because of the perturbations of passing stars. A planet orbiting at 1 astronomical unit around a star that is within the core of a dense cluster such as 47 Tucanae would only survive on the order of 108 years. There is a planetary system orbiting a pulsar (PSR B1620−26) that belongs to the globular cluster M4, but these planets likely formed after the event that created the pulsar. Some globular clusters, like Omega Centauri in the Milky Way and G1 in M31, are extraordinarily massive, with several million solar masses (M☉) and multiple stellar populations. Both can be regarded as evidence that supermassive globular clusters are in fact the cores of dwarf galaxies that are consumed by the larger galaxies. About a quarter of the globular cluster population in the Milky Way may have been accreted along with their host dwarf galaxy. Several globular clusters (like M15) have extremely massive cores which may harbor black holes, although simulations suggest that a less massive black hole or central concentration of neutron stars or massive white dwarfs explain observations equally well. Messier 53 contains an unusual number of a type of star called blue stragglers. 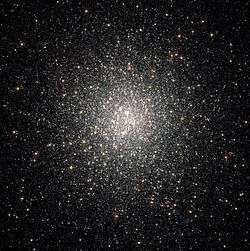 Globular clusters normally consist of Population II stars, which have a low proportion of elements other than hydrogen and helium when compared to Population I stars such as the Sun. Astronomers refer to these heavier elements as metals and to the proportions of these elements as the metallicity. These elements are produced by stellar nucleosynthesis and then are recycled into the interstellar medium, where they enter the next generation of stars. Hence the proportion of metals can be an indication of the age of a star, with older stars typically having a lower metallicity. The Dutch astronomer Pieter Oosterhoff noticed that there appear to be two populations of globular clusters, which became known as Oosterhoff groups. The second group has a slightly longer period of RR Lyrae variable stars. Both groups have weak lines of metallic elements. But the lines in the stars of Oosterhoff type I (OoI) cluster are not quite as weak as those in type II (OoII). Hence type I are referred to as "metal-rich" (e.g. Terzan 7) while type II are "metal-poor" (e.g. ESO 280-SC06). These two populations have been observed in many galaxies, especially massive elliptical galaxies. Both groups are nearly as old as the universe itself and are of similar ages, but differ in their metal abundances. Many scenarios have been suggested to explain these subpopulations, including violent gas-rich galaxy mergers, the accretion of dwarf galaxies, and multiple phases of star formation in a single galaxy. In the Milky Way, the metal-poor clusters are associated with the halo and the metal-rich clusters with the bulge. In the Milky Way it has been discovered that the large majority of the low metallicity clusters are aligned along a plane in the outer part of the galaxy's halo. This result argues in favor of the view that type II clusters in the galaxy were captured from a satellite galaxy, rather than being the oldest members of the Milky Way's globular cluster system as had been previously thought. The difference between the two cluster types would then be explained by a time delay between when the two galaxies formed their cluster systems. Globular clusters have a very high star density, and therefore close interactions and near-collisions of stars occur relatively often. Due to these chance encounters, some exotic classes of stars, such as blue stragglers, millisecond pulsars and low-mass X-ray binaries, are much more common in globular clusters. A blue straggler is formed from the merger of two stars, possibly as a result of an encounter with a binary system. The resulting star has a higher temperature than comparable stars in the cluster with the same luminosity, and thus differs from the main sequence stars formed at the beginning of the cluster. Astronomers have searched for black holes within globular clusters since the 1970s. The resolution requirements for this task, however, are exacting, and it is only with the Hubble space telescope that the first confirmed discoveries have been made. In independent programs, a 4,000 M☉ intermediate-mass black hole has been suggested to exist based on HST observations in the globular cluster M15 and a 20,000 M☉ black hole in the Mayall II cluster in the Andromeda Galaxy. Both x-ray and radio emissions from Mayall II appear to be consistent with an intermediate-mass black hole. These are of particular interest because they are the first black holes discovered that were intermediate in mass between the conventional stellar-mass black hole and the supermassive black holes discovered at the cores of galaxies. The mass of these intermediate mass black holes is proportional to the mass of the clusters, following a pattern previously discovered between supermassive black holes and their surrounding galaxies. Claims of intermediate mass black holes have been met with some skepticism. The heaviest objects in globular clusters are expected to migrate to the cluster center due to mass segregation. As pointed out in two papers by Holger Baumgardt and collaborators, the mass-to-light ratio should rise sharply towards the center of the cluster, even without a black hole, in both M15 and Mayall II. 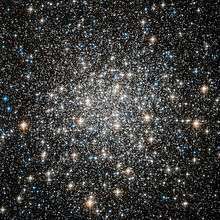 Messier 5 is a globular cluster consisting of hundreds of thousands of stars bound together by their collective gravity. The Hertzsprung-Russell diagram (HR-diagram) is a graph of a large sample of stars that plots their visual absolute magnitude against their color index. The color index, B−V, is the difference between the magnitude of the star in blue light, or B, and the magnitude in visual light (green-yellow), or V. Large positive values indicate a red star with a cool surface temperature, while negative values imply a blue star with a hotter surface. When the stars near the Sun are plotted on an HR diagram, it displays a distribution of stars of various masses, ages, and compositions. Many of the stars lie relatively close to a sloping curve with increasing absolute magnitude as the stars are hotter, known as main-sequence stars. However the diagram also typically includes stars that are in later stages of their evolution and have wandered away from this main-sequence curve. As all the stars of a globular cluster are at approximately the same distance from us, their absolute magnitudes differ from their visual magnitude by about the same amount. The main-sequence stars in the globular cluster will fall along a line that is believed to be comparable to similar stars in the solar neighborhood. The accuracy of this assumption is confirmed by comparable results obtained by comparing the magnitudes of nearby short-period variables, such as RR Lyrae stars and cepheid variables, with those in the cluster. By matching up these curves on the HR diagram the absolute magnitude of main-sequence stars in the cluster can also be determined. This in turn provides a distance estimate to the cluster, based on the visual magnitude of the stars. The difference between the relative and absolute magnitude, the distance modulus, yields this estimate of the distance. When the stars of a particular globular cluster are plotted on an HR diagram, in many cases nearly all of the stars fall upon a relatively well defined curve. This differs from the HR diagram of stars near the Sun, which lumps together stars of differing ages and origins. The shape of the curve for a globular cluster is characteristic of a grouping of stars that were formed at approximately the same time and from the same materials, differing only in their initial mass. As the position of each star in the HR diagram varies with age, the shape of the curve for a globular cluster can be used to measure the overall age of the star population. However, the above-mentioned historic process of determining the age and distance to globular clusters is not as robust as first thought, since the morphology and luminosity of globular cluster stars in color-magnitude diagrams are influenced by numerous parameters, many of which are still being actively researched. Certain clusters even display populations that are absent from other globular clusters (e.g., blue hook stars), or feature multiple populations. The historical paradigm that all globular clusters consist of stars born at exactly the same time, or sharing exactly the same chemical abundance, has likewise been overturned (e.g., NGC 2808). Further, the morphology of the cluster stars in a color-magnitude diagram, and that includes the brightnesses of distance indicators such as RR Lyrae variable members, can be influenced by observational biases. One such effect is called blending, and it arises because the cores of globular clusters are so dense that in low-resolution observations multiple (unresolved) stars may appear as a single target. Thus the brightness measured for that seemingly single star (e.g., an RR Lyrae variable) is erroneously too bright, given those unresolved stars contributed to the brightness determined. Consequently, the computed distance is wrong, and more importantly, certain researchers have argued that the blending effect can introduce a systematic uncertainty into the cosmic distance ladder, and may bias the estimated age of the Universe and the Hubble constant. Color-magnitude diagram for the globular cluster M3. Note the characteristic "knee" in the curve at magnitude 19 where stars begin entering the giant stage of their evolutionary path. The most massive main-sequence stars will also have the highest absolute magnitude, and these will be the first to evolve into the giant star stage. As the cluster ages, stars of successively lower masses will also enter the giant star stage. Thus the age of a single population cluster can be measured by looking for the stars that are just beginning to enter the giant star stage. This forms a "knee" in the HR diagram, bending to the upper right from the main-sequence line. The absolute magnitude at this bend is directly a function of the age of globular cluster, so an age scale can be plotted on an axis parallel to the magnitude. In addition, globular clusters can be dated by looking at the temperatures of the coolest white dwarfs. Typical results for globular clusters are that they may be as old as 12.7 billion years. This is in contrast to open clusters which are only tens of millions of years old. The ages of globular clusters place a bound on the age limit of the entire universe. This lower limit has been a significant constraint in cosmology. Historically, astronomers were faced with age estimates of globular clusters that appeared older than cosmological models would allow. However, better measurements of cosmological parameters through deep sky surveys and satellites such as the Hubble Space Telescope appear to have resolved this issue. Evolutionary studies of globular clusters can also be used to determine changes due to the starting composition of the gas and dust that formed the cluster. That is, the evolutionary tracks change with changes in the abundance of heavy elements. The data obtained from studies of globular clusters are then used to study the evolution of the Milky Way as a whole. In globular clusters a few stars known as blue stragglers are observed, apparently continuing the main sequence in the direction of brighter, bluer stars. The origins of these stars is still unclear, but most models suggest that these stars are the result of mass transfer in multiple star systems. NGC 411 is classified as an open cluster. In contrast to open clusters, most globular clusters remain gravitationally bound for time periods comparable to the life spans of the majority of their stars. However, a possible exception is when strong tidal interactions with other large masses result in the dispersal of the stars. After they are formed, the stars in the globular cluster begin to interact gravitationally with each other. As a result, the velocity vectors of the stars are steadily modified, and the stars lose any history of their original velocity. The characteristic interval for this to occur is the relaxation time. This is related to the characteristic length of time a star needs to cross the cluster as well as the number of stellar masses in the system. The value of the relaxation time varies by cluster, but the mean value is on the order of 109 years. Although globular clusters generally appear spherical in form, ellipticities can occur due to tidal interactions. Clusters within the Milky Way and the Andromeda Galaxy are typically oblate spheroids in shape, while those in the Large Magellanic Cloud are more elliptical. Astronomers characterize the morphology of a globular cluster by means of standard radii. These are the core radius (rc), the half-light radius (rh), and the tidal (or Jacobi) radius (rt). The overall luminosity of the cluster steadily decreases with distance from the core, and the core radius is the distance at which the apparent surface luminosity has dropped by half. A comparable quantity is the half-light radius, or the distance from the core within which half the total luminosity from the cluster is received. This is typically larger than the core radius. Note that the half-light radius includes stars in the outer part of the cluster that happen to lie along the line of sight, so theorists will also use the half-mass radius (rm)—the radius from the core that contains half the total mass of the cluster. When the half-mass radius of a cluster is small relative to the overall size, it has a dense core. An example of this is Messier 3 (M3), which has an overall visible dimension of about 18 arc minutes, but a half-mass radius of only 1.12 arc minutes. Almost all globular clusters have a half-light radius of less than 10 pc, although there are well-established globular clusters with very large radii (i.e. NGC 2419 (Rh = 18 pc) and Palomar 14 (Rh = 25 pc)). Finally the tidal radius, or Hill sphere, is the distance from the center of the globular cluster at which the external gravitation of the galaxy has more influence over the stars in the cluster than does the cluster itself. This is the distance at which the individual stars belonging to a cluster can be separated away by the galaxy. The tidal radius of M3 is about 40 arc minutes, or about 113 pc at the distance of 10.4 kpc. In measuring the luminosity curve of a given globular cluster as a function of distance from the core, most clusters in the Milky Way increase steadily in luminosity as this distance decreases, up to a certain distance from the core, then the luminosity levels off. Typically this distance is about 1–2 parsecs from the core. However about 20% of the globular clusters have undergone a process termed "core collapse". In this type of cluster, the luminosity continues to increase steadily all the way to the core region. An example of a core-collapsed globular is M15. 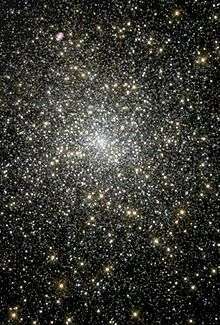 47 Tucanae – the second most luminous globular cluster in the Milky Way, after Omega Centauri. Globular cluster NGC 1854 is located in the Large Magellanic Cloud. The Hubble Space Telescope has been used to provide convincing observational evidence of this stellar mass-sorting process in globular clusters. Heavier stars slow down and crowd at the cluster's core, while lighter stars pick up speed and tend to spend more time at the cluster's periphery. The globular star cluster 47 Tucanae, which is made up of about 1 million stars, is one of the densest globular clusters in the Southern Hemisphere. This cluster was subjected to an intensive photographic survey, which allowed astronomers to track the motion of its stars. Precise velocities were obtained for nearly 15,000 stars in this cluster. A 2008 study by John Fregeau of 13 globular clusters in the Milky Way shows that three of them have an unusually large number of X-ray sources, or X-ray binaries, suggesting the clusters are middle-aged. Previously, these globular clusters had been classified as being in old age because they had very tight concentrations of stars in their centers, another test of age used by astronomers. The implication is that most globular clusters, including the other ten studied by Fregeau, are not in middle age as previously thought, but are actually in 'adolescence'. The overall luminosities of the globular clusters within the Milky Way and the Andromeda Galaxy can be modeled by means of a gaussian curve. This gaussian can be represented by means of an average magnitude Mv and a variance σ2. This distribution of globular cluster luminosities is called the Globular Cluster Luminosity Function (GCLF). (For the Milky Way, Mv = −7.20 ± 0.13, σ = 1.1 ± 0.1 magnitudes.) The GCLF has also been used as a "standard candle" for measuring the distance to other galaxies, under the assumption that the globular clusters in remote galaxies follow the same principles as they do in the Milky Way. Computing the interactions between the stars within a globular cluster requires solving what is termed the N-body problem. That is, each of the stars within the cluster continually interacts with the other N−1 stars, where N is the total number of stars in the cluster. The naive CPU computational "cost" for a dynamic simulation increases in proportion to N 2 (each of N objects must interact pairwise with each of the other N objects), so the potential computing requirements to accurately simulate such a cluster can be enormous. An efficient method of mathematically simulating the N-body dynamics of a globular cluster is done by subdividing into small volumes and velocity ranges, and using probabilities to describe the locations of the stars. The motions are then described by means of a formula called the Fokker–Planck equation. This can be solved by a simplified form of the equation, or by running Monte Carlo simulations and using random values. However the simulation becomes more difficult when the effects of binaries and the interaction with external gravitation forces (such as from the Milky Way galaxy) must also be included. The results of N-body simulations have shown that the stars can follow unusual paths through the cluster, often forming loops and often falling more directly toward the core than would a single star orbiting a central mass. In addition, due to interactions with other stars that result in an increase in velocity, some of the stars gain sufficient energy to escape the cluster. Over long periods of time this will result in a dissipation of the cluster, a process termed evaporation. The typical time scale for the evaporation of a globular cluster is 1010 years. In 2010 it became possible to directly compute, star by star, N-body simulations of a globular cluster over the course of its lifetime. Binary stars form a significant portion of the total population of stellar systems, with up to half of all stars occurring in binary systems. Numerical simulations of globular clusters have demonstrated that binaries can hinder and even reverse the process of core collapse in globular clusters. When a star in a cluster has a gravitational encounter with a binary system, a possible result is that the binary becomes more tightly bound and kinetic energy is added to the solitary star. When the massive stars in the cluster are sped up by this process, it reduces the contraction at the core and limits core collapse. The ultimate fate of a globular cluster must be either to accrete stars at its core, causing its steady contraction, or gradual shedding of stars from its outer layers. Messier 10 lies about 15000 light-years from Earth, in the constellation of Ophiuchus. The distinction between cluster types is not always clear-cut, and objects have been found that blur the lines between the categories. For example, BH 176 in the southern part of the Milky Way has properties of both an open and a globular cluster. In 2005, astronomers discovered a completely new type of star cluster in the Andromeda Galaxy, which is, in several ways, very similar to globular clusters. The new-found clusters contain hundreds of thousands of stars, a similar number to that found in globular clusters. 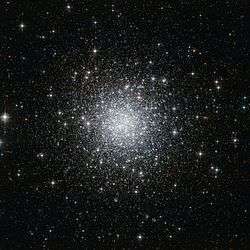 The clusters share other characteristics with globular clusters such as stellar populations and metallicity. What distinguishes them from the globular clusters is that they are much larger – several hundred light-years across – and hundreds of times less dense. The distances between the stars are, therefore, much greater within the newly discovered extended clusters. Parametrically, these clusters lie somewhere between a globular cluster and a dwarf spheroidal galaxy. How these clusters are formed is not yet known, but their formation might well be related to that of globular clusters. Why M31 has such clusters, while the Milky Way does not, is not yet known. It is also unknown if any other galaxy contains these types of clusters, but it would be very unlikely that M31 is the sole galaxy with extended clusters. When a globular cluster has a close encounter with a large mass, such as the core region of a galaxy, it undergoes a tidal interaction. The difference in the pull of gravity between the part of the cluster nearest the mass and the pull on the furthest part of the cluster results in a tidal force. A "tidal shock" occurs whenever the orbit of a cluster takes it through the plane of a galaxy. As a result of a tidal shock, streams of stars can be pulled away from the cluster halo, leaving only the core part of the cluster. These tidal interaction effects create tails of stars that can extend up to several degrees of arc away from the cluster. These tails typically both precede and follow the cluster along its orbit. The tails can accumulate significant portions of the original mass of the cluster, and can form clumplike features. The globular cluster Palomar 5, for example, is near the apogalactic point of its orbit after passing through the Milky Way. Streams of stars extend outward toward the front and rear of the orbital path of this cluster, stretching out to distances of 13,000 light-years. Tidal interactions have stripped away much of the mass from Palomar 5, and further interactions as it passes through the galactic core are expected to transform it into a long stream of stars orbiting the Milky Way halo. Tidal interactions add kinetic energy into a globular cluster, dramatically increasing the evaporation rate and shrinking the size of the cluster. Not only does tidal shock strip off the outer stars from a globular cluster, but the increased evaporation accelerates the process of core collapse. The same physical mechanism may be at work in dwarf spheroidal galaxies such as the Sagittarius Dwarf, which appears to be undergoing tidal disruption due to its proximity to the Milky Way. There are many globular clusters with a retrograde orbit round the Milky Way Galaxy. A hypervelocity globular cluster was discovered around Messier 87 in 2014, having a velocity in excess of the escape velocity of M87. In spite of the lower likelihood of giant planet formation, just such an object has been found in the globular cluster Messier 4. This planet was detected orbiting a pulsar in the binary star system PSR B1620-26. The eccentric and highly inclined orbit of the planet suggests it may have been formed around another star in the cluster, then was later "exchanged" into its current arrangement. The likelihood of close encounters between stars in a globular cluster can disrupt planetary systems, some of which break loose to become free floating planets. Even close orbiting planets can become disrupted, potentially leading to orbital decay and an increase in orbital eccentricity and tidal effects. ↑ Harris, William E. (February 2003). "CATALOG OF PARAMETERS FOR MILKY WAY GLOBULAR CLUSTERS: THE DATABASE". Retrieved 2009-12-23. ↑ Frommert, Hartmut (August 2007). "Milky Way Globular Clusters". SEDS. Retrieved 2008-02-26. 1 2 Ashman, Keith M.; Zepf, Stephen E. (1992). "The formation of globular clusters in merging and interacting galaxies". Astrophysical Journal, Part 1. 384: 50–61. Bibcode:1992ApJ...384...50A. doi:10.1086/170850. ↑ Barmby, P.; Huchra, J. P. (2001). "M31 Globular Clusters in the Hubble Space Telescope Archive. I. Cluster Detection and Completeleness". The Astronomical Journal. 122 (5): 2458–2468. arXiv:astro-ph/0107401 . Bibcode:2001AJ....122.2458B. doi:10.1086/323457. ↑ McLaughlin, Dean E.; Harris, William E.; Hanes, David A. (1994). "The spatial structure of the M87 globular cluster system". Astrophysical Journal. 422 (2): 486–507. Bibcode:1994ApJ...422..486M. doi:10.1086/173744. ↑ Harris, William E. (1991). "Globular cluster systems in galaxies beyond the Local Group". Annual Review of Astronomy and Astrophysics. 29 (1): 543–579. Bibcode:1991ARA&A..29..543H. doi:10.1146/annurev.aa.29.090191.002551. ↑ Dinescu, D. I.; Majewski, S. R.; Girard, T. M.; Cudworth, K. M. (2000). "The Absolute Proper Motion of Palomar 12: A Case for Tidal Capture from the Sagittarius Dwarf Spheroidal Galaxy". The Astronomical Journal. 120 (4): 1892–1905. arXiv:astro-ph/0006314 . Bibcode:2000astro.ph..6314D. doi:10.1086/301552. ↑ Lotz, Jennifer M.; Miller, Bryan W.; Ferguson, Henry C. (September 2004). "The Colors of Dwarf Elliptical Galaxy Globular Cluster Systems, Nuclei, and Stellar Halos". The Astrophysical Journal. 613 (1): 262–278. arXiv:astro-ph/0406002 . Bibcode:2004ApJ...613..262L. doi:10.1086/422871. ↑ Sharp, N. A. "M22, NGC6656". REU program/NOAO/AURA/NSF. Retrieved 2006-08-16. ↑ Frommert, Hartmut; Kronberg, Christine. "Clobular Star Clusters". The Messier Catalog. SEDS. Archived from the original on 19 June 2015. Retrieved 19 June 2015. ↑ Ashman, Keith M.; Zepf, Stephen E. (1998). Globular cluster systems. Cambridge astrophysics series. 30. Cambridge University Press. p. 2. ISBN 0-521-55057-2. ↑ Shapley, Harlow (1918). "Globular Clusters and the Structure of the Galactic System". Publications of the Astronomical Society of the Pacific. 30 (173): 42+. Bibcode:1918PASP...30...42S. doi:10.1086/122686. ↑ Hogg, Helen Battles Sawyer (1965). "Harlow Shapley and Globular Clusters". Publications of the Astronomical Society of the Pacific. 77 (458): 336–46. Bibcode:1965PASP...77..336S. doi:10.1086/128229. ↑ "The Very Large Telescope discovers new kind of globular star cluster". Astronomy. May 13, 2015. Retrieved May 14, 2015. ↑ Piotto, G.; et al. (May 2007). "A Triple Main Sequence in the Globular Cluster NGC 2808". The Astrophysical Journal. 661 (1): L53–L56. arXiv:astro-ph/0703767 . Bibcode:2007ApJ...661L..53P. doi:10.1086/518503. ↑ Chaboyer, B. Globular Cluster Age Dating. Astrophysical Ages and Times Scales, ASP Conference Series. 245. pp. 162–172. Bibcode:2001ASPC..245..162C. ↑ Piotto, Giampaolo (June 2009). Observations of multiple populations in star clusters. The Ages of Stars, Proceedings of the International Astronomical Union, IAU Symposium. 258. pp. 233–244. Bibcode:2009IAUS..258..233P. doi:10.1017/S1743921309031883. ↑ Weaver, D.; Villard, R.; Christensen, L. L.; Piotto, G.; Bedin, L. (2007-05-02). "Hubble Finds Multiple Stellar 'Baby Booms' in a Globular Cluster". Hubble News Desk. Retrieved 2007-05-01. ↑ Amaro-Seoane, P.; Konstantinidis, S.; Brem, P.; Catelan, M. (2013). "Mergers of multimetallic globular clusters: the role of dynamics". Monthly Notices of the Royal Astronomical Society. 435 (1): 809–821. arXiv:1108.5173 . Bibcode:2013MNRAS.435..809A. doi:10.1093/mnras/stt1351. ↑ "This Star Cluster Is Not What It Seems". www.eso.org. European Southern Observatory. Retrieved 12 September 2014. ↑ Elmegreen, B. G.; Efremov, Y. N. (1999). "A Universal Formation Mechanism for Open and Globular Clusters in Turbulent Gas". Astrophysical Journal. 480 (2): 235–245. Bibcode:1997ApJ...480..235E. doi:10.1086/303966. ↑ Burkert, Andreas; Tremaine, Scott (April 1, 2010). "A correlation between central supermassive black holes and the globular cluster systems of early-type galaxies". arXiv:1004.0137 [astro-ph.CO]. A possible explanation is that both large black-hole masses and large globular cluster populations are associated with recent major mergers. ↑ "Young and Exotic Stellar Zoo: ESO's Telescopes Uncover Super Star Cluster in the Milky Way". ESO. 2005-03-22. Retrieved 2007-03-20. ↑ "ESA/Hubble Picture of the Week". Engulfed by Stars Near the Milky Way’s Heart. Retrieved 28 June 2011. ↑ Talpur, Jon (1997). "A Guide to Globular Clusters". Keele University. Retrieved 2007-04-25. ↑ Sigurdsson, Steinn (1992). 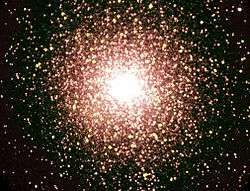 "Planets in globular clusters?". Astrophysical Journal. 399 (1): L95–L97. Bibcode:1992ApJ...399L..95S. doi:10.1086/186615. ↑ Bekki, K.; Freeman, K. C. (December 2003). "Formation of ω Centauri from an ancient nucleated dwarf galaxy in the young Galactic disc". Monthly Notices of the Royal Astronomical Society. 346 (2): L11–L15. arXiv:astro-ph/0310348 . Bibcode:2003MNRAS.346L..11B. doi:10.1046/j.1365-2966.2003.07275.x. ↑ Forbes, Duncan A.; Bridges, Terry (January 25, 2010). "Accreted versus In Situ Milky Way Globular Clusters". arXiv:1001.4289 [astro-ph.GA]. ↑ van der Marel, Roeland (2002-03-03). "Black Holes in Globular Clusters". Space Telescope Science Institute. Retrieved 2006-06-08. ↑ "Spot the Difference — Hubble spies another globular cluster, but with a secret". Picture of the Week. ESA/Hubble. Retrieved 5 October 2011. 1 2 van Albada, T. S.; Baker, Norman (1973). "On the Two Oosterhoff Groups of Globular Clusters". Astrophysical Journal. 185: 477–498. Bibcode:1973ApJ...185..477V. doi:10.1086/152434. ↑ "ESO 280-SC06". Globular cluster ESO 280-SC06, in Ara. Retrieved 2014-04-19. ↑ Harris, W. E. (1976). "Spatial structure of the globular cluster system and the distance to the galactic center". Astronomical Journal. 81: 1095–1116. Bibcode:1976AJ.....81.1095H. doi:10.1086/111991. ↑ Lee, Y. W.; Yoon, S. J. (2002). "On the Construction of the Heavens". An Aligned Stream of Low-Metallicity Clusters in the Halo of the Milky Way. 297 (5581): 578–81. arXiv:astro-ph/0207607 . Bibcode:2002Sci...297..578Y. doi:10.1126/science.1073090. PMID 12142530. 1 2 Leonard, Peter J. T. (1989). "Stellar collisions in globular clusters and the blue straggler problem". The Astronomical Journal. 98: 217–226. Bibcode:1989AJ.....98..217L. doi:10.1086/115138. 1 2 Rubin, V. C.; Ford, W. K. J. (1999). "A Thousand Blazing Suns: The Inner Life of Globular Clusters". Mercury. 28: 26. Bibcode:1999Mercu..28d..26M. Retrieved 2006-06-02. ↑ Savage, D.; Neal, N.; Villard, R.; Johnson, R.; Lebo, H. (2002-09-17). "Hubble Discovers Black Holes in Unexpected Places". HubbleSite. Space Telescope Science Institute. Retrieved 2006-05-25. ↑ Finley, Dave (2007-05-28). "Star Cluster Holds Midweight Black Hole, VLA Indicates". NRAO. Retrieved 2007-05-29. ↑ Baumgardt, Holger; Hut, Piet; Makino, Junichiro; McMillan, Steve; Portegies Zwart, Simon (2003). "On the Central Structure of M15". Astrophysical Journal Letters. 582 (1): 21. arXiv:astro-ph/0210133 . Bibcode:2003ApJ...582L..21B. doi:10.1086/367537. ↑ Baumgardt, Holger; Hut, Piet; Makino, Junichiro; McMillan, Steve; Portegies Zwart, Simon (2003). "A Dynamical Model for the Globular Cluster G1". Astrophysical Journal Letters. 589 (1): 25. arXiv:astro-ph/0301469 . Bibcode:2003ApJ...589L..25B. doi:10.1086/375802. Retrieved 2006-09-13. ↑ "Cosmic fairy lights". ESA/Hubble Picture of the Week. Retrieved 29 April 2014. ↑ Shapley, H. (1917). "Studies based on the colors and magnitudes in stellar clusters. I,II,III". Astrophysical Journal. 45: 118–141. Bibcode:1917ApJ....45..118S. doi:10.1086/142314. ↑ Sandage, A.R. (1957). "Observational Approach to Evolution. III. Semiempirical Evolution Tracks for M67 and M3". Astrophysical Journal. 126: 326. Bibcode:1957ApJ...126..326S. doi:10.1086/146405. ↑ Hansen, B. M. S.; Brewer, J.; Fahlman, G. G.; Gibson, B. K.; Ibata, R.; Limongi, M.; Rich, R. M.; Richer, H. B.; Shara, M. M.; Stetson, P. B. (2002). "The White Dwarf Cooling Sequence of the Globular Cluster Messier 4". Astrophysical Journal Letters. 574 (2): L155. arXiv:astro-ph/0205087 . Bibcode:2002ApJ...574L.155H. doi:10.1086/342528. ↑ Majaess, D. (February 23, 2013). "Nearby Ancient Star is Almost as Old as the Universe". Universe Today. Retrieved November 29, 2014. ↑ "Ashes from the Elder Brethren — UVES Observes Stellar Abundance Anomalies in Globular Clusters" (Press release). 2001-03-01. Retrieved 2006-05-26. ↑ "Appearances can be deceptive". ESO Picture of the Week. Retrieved 12 February 2013. 1 2 3 Benacquista, Matthew J. (2006). "Globular cluster structure". Living Reviews in Relativity. Retrieved 2006-08-14. ↑ Staneva, A.; Spassova, N.; Golev, V. (1996). "The Ellipticities of Globular Clusters in the Andromeda Galaxy". Astronomy and Astrophysics Supplement. 116 (3): 447–461. Bibcode:1996A&AS..116..447S. doi:10.1051/aas:1996127. ↑ Frenk, C. S.; White, S. D. M. (1980). "The ellipticities of Galactic and LMC globular clusters". Monthly Notices of the Royal Astronomical Society. 286 (3): L39–L42. arXiv:astro-ph/9702024 . Bibcode:1997astro.ph..2024G. doi:10.1093/mnras/286.3.l39. ↑ Kenneth Janes (November 2000). "Star Clusters" (PDF). Encyclopedia of Astronomy and Astrophysics. p. 2. Retrieved 26 March 2014. ↑ van den Bergh, Sidney (November 2007). "Globular Clusters and Dwarf Spheroidal Galaxies". Monthly Notices of the Royal Astronomical Society, in press. 385 (1): L20. arXiv:0711.4795 . Bibcode:2008MNRAS.385L..20V. doi:10.1111/j.1745-3933.2008.00424.x. ↑ Da Costa, G. S.; Freeman, K. C. (May 1976). "The structure and mass function of the globular cluster M3". ApJ. 206 (1): 128–137. Bibcode:1976ApJ...206..128D. doi:10.1086/154363. Retrieved 6 December 2014. ↑ Brosche, P.; Odenkirchen, M.; Geffert, M. (March 1999). "Instantaneous and average tidal radii of globular clusters". New Astronomy. 4 (2): 133–139. Bibcode:1999NewA....4..133B. doi:10.1016/S1384-1076(99)00014-7. Retrieved 7 December 2014. ↑ Djorgovski, S.; King, I. R. (1986). "A preliminary survey of collapsed cores in globular clusters". Astrophysical Journal. 305: L61–L65. Bibcode:1986ApJ...305L..61D. doi:10.1086/184685. ↑ Ashman, Keith M.; Zepf, Stephen E. (1998). Globular cluster systems. Cambridge astrophysics series. 30. Cambridge University Press. p. 29. ISBN 0-521-55057-2. ↑ Vanbeveren, D. (2001). The influence of binaries on stellar population studies. Astrophysics and space science library. 264. Springer. p. 397. ISBN 0-7923-7104-6. ↑ Gnedin, Oleg Y.; Lee, Hyung Mok; Ostriker, Jeremiah P. (September 1999). "Effects of Tidal Shocks on the Evolution of Globular Clusters". The Astrophysical Journal. 522 (2): 935–949. arXiv:astro-ph/9806245 . Bibcode:1999ApJ...522..935G. doi:10.1086/307659. ↑ Bahcall, John N.; Piran, Tsvi; Weinberg, Steven (2004). Dark matter in the universe (2nd ed.). World Scientific. p. 51. ISBN 981-238-841-9. ↑ "The stars of the Large Magellanic Cloud". Retrieved 21 June 2016. ↑ "Stellar Sorting in Globular Cluster 47". Hubble News Desk. 2006-10-04. Retrieved 2006-10-24. ↑ Baldwin, Emily (2008-04-29). 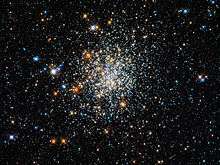 "Old globular clusters surprisingly young". Astronomy Now Online. Retrieved 2008-05-02. ↑ Secker, Jeff (1992). "A Statistical Investigation into the Shape of the Globular cluster Luminosity Distribution". Astronomical Journal. 104 (4): 1472–1481. Bibcode:1992AJ....104.1472S. doi:10.1086/116332. ↑ Heggie, D. C.; Giersz, M.; Spurzem, R.; Takahashi, K. (1998). Johannes Andersen, ed. Dynamical Simulations: Methods and Comparisons. Highlights of Astronomy Vol. 11A, as presented at the Joint Discussion 14 of the XXIIIrd General Assembly of the IAU, 1997. Kluwer Academic Publishers. p. 591. Bibcode:1997astro.ph.11191H. ↑ Benacquista, Matthew J. (2006). "Relativistic Binaries in Globular Clusters". Living Reviews in Relativity. 9. doi:10.12942/lrr-2006-2. ↑ Hasani Zonoozi, Akram; et al. (March 2011). "Direct N-body simulations of globular clusters – I. Palomar 14". Monthly Notices of the Royal Astronomical Society. 411 (3): 1989–2001. arXiv:1010.2210 . Bibcode:2011MNRAS.411.1989Z. doi:10.1111/j.1365-2966.2010.17831.x. ↑ Zhou, Yuan; Zhong, Xie Guang (June 1990). "The core evolution of a globular cluster containing massive black holes". Astrophysics and Space Science. 168 (2): 233–241. Bibcode:1990Ap&SS.168..233Y. doi:10.1007/BF00636869. ↑ Pooley, Dave. "Globular Cluster Dynamics: the importance of close binaries in a real N-body system". UW-Madison. Retrieved 2008-12-11. ↑ "Globular Cluster M10". ESA/Hubble Picture of the Week. Retrieved 18 June 2012. 1 2 Huxor, A. P.; Tanvir, N. R.; Irwin, M. J.; R. Ibata (2005). "A new population of extended, luminous, star clusters in the halo of M31". Monthly Notices of the Royal Astronomical Society. 360 (3): 993–1006. arXiv:astro-ph/0412223 . Bibcode:2005MNRAS.360.1007H. doi:10.1111/j.1365-2966.2005.09086.x. ↑ Lauchner, A.; Wilhelm, R.; Beers, T. C.; Allende Prieto, C. (December 2003). A Search for Kinematic Evidence of Tidal Tails in Globular Clusters. American Astronomical Society Meeting 203, #112.26. Bibcode:2003AAS...20311226L. ↑ Di Matteo, P.; Miocchi, P.; Capuzzo Dolcetta, R. (May 2004). Formation and Evolution of Clumpy Tidal Tails in Globular Clusters. American Astronomical Society, DDA meeting #35, #03.03. Bibcode:2004DDA....35.0303D. ↑ Staude, Jakob (2002-06-03). "Sky Survey Unveils Star Cluster Shredded By The Milky Way". Image of the Week. Sloan Digital Sky Survey. Retrieved 2006-06-02. ↑ Kravtsov, V. V. (2001). "Globular Clusters and Dwarf Spheroidal Galaxies of the Outer Galactic Halo: on the Putative Scenario of their Formation" (PDF). Astronomical and Astrophysical Transactions. 20 (1): 89–92. Bibcode:2001A&AT...20...89K. doi:10.1080/10556790108208191. Retrieved 2010-03-02. ↑ "Space Friday: Planet Locations, a SUPERnova, and a Black Hole". California Academy of Sciences. 15 January 2016. Retrieved 15 May 2016. ↑ Gonzalez, Guillermo; Brownlee, Donald; Ward, Peter (July 2001). "The Galactic Habitable Zone: Galactic Chemical Evolution". Icarus. 152 (1): 185–200. arXiv:astro-ph/0103165 . Bibcode:2001Icar..152..185G. doi:10.1006/icar.2001.6617. ↑ Sigurdsson, S.; Stairs, I. H.; Moody, K.; Arzoumanian, K. M. Z.; Thorsett, S. E. (2008). Fischer, D.; Rasio, F. A.; Thorsett, S. E.; Wolszczan, A., eds. "Planets Around Pulsars in Globular Clusters". Extreme Solar Systems, ASP Conference Series, proceedings of the conference held 25–29 June 2007, at Santorini Island, Greece. 398: 119. Bibcode:2008ASPC..398..119S. ↑ Spurzem, R.; et al. (May 2009). "Dynamics of Planetary Systems in Star Clusters". The Astrophysical Journal. 697 (1): 458–482. arXiv:astro-ph/0612757 . Bibcode:2009ApJ...697..458S. doi:10.1088/0004-637X/697/1/458. Binney, James; Tremaine, Scott (1987). Galactic Dynamics (First ed.). Princeton, New Jersey: Princeton University Press. ISBN 0-691-08444-0. Wikimedia Commons has media related to Globular clusters.